I’m sitting at my favorite Ellensburg coffee shop this morning, savoring the memories of last night’s art talk and opening reception. What joy! Atop the lift this week, immersed in the gossamer membrane of Numinous, has been like living in a dreamscape. Today—the dream became reality. What a rush it was to hear the delighted murmurings of visitors as they poured into gallery tonight! Hugs, new friends. Extra special — meeting Andy Behlre. The artist has been friends of my sons for a long time. Less than a year ago, Andy moved to Zillah, WA from Alabama,where he became actively involved in the Mighty Tieton. 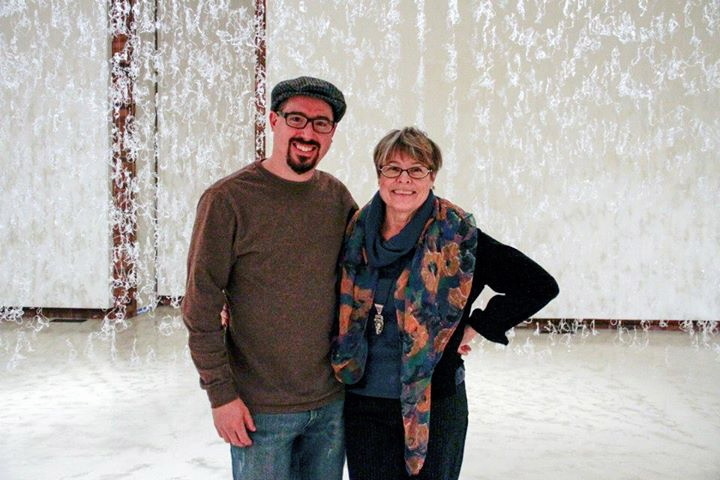 Previously, he lived in Tempe, where earned his MFA and helped build exhibits for galleries and museums, including the James Terrell’s installation at the Scottsdale Museum of Contemporary Art. We made plans for me to stop at his place for a studio visit today on my drive home. I’m excited. Check out his website and the brilliant installation he created for last year’s Art Prize! I cannot think of another thing, except to acknowledge how lucky I am—to be able to do what I do! One last gulp of coffee. Then off to the gallery to say goodbye and shoot photos before I hit the road for home sweet home.